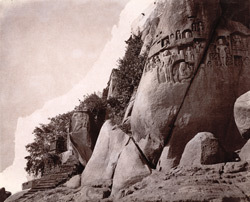 Photograph of the rock-cut sculptures below the temple at Jangira, Bhagalpur District, taken by Joseph David Beglar around 1879-80 as part of the Archaeological Survey of India Collections: Indian Museum Series (Duplicates). Jangira is famous for the two great sacred rocks in the Ganga river. One of them has a temple on the summit and large rocks on this island are covered with carvings in high relief which represent Vishnu and Shiva under their different aspects. They date mainly from the 8th century.